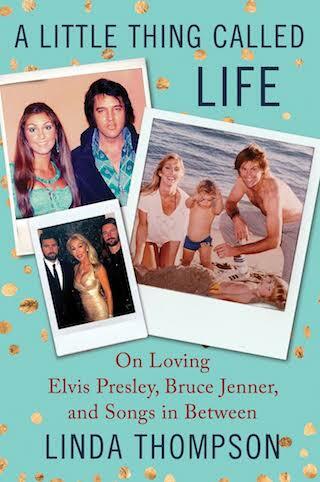 Taking four decades to live her life “more fully,” however, gave Linda Thompson much more than Elvis to write about, as indicated in her book’s sub-title: “On Loving Elvis Presley, Bruce Jenner, and Songs in Between.” The first half of her book focuses on her four-and-a-half years with Elvis, with the second half covering the four decades of her eventful life since parting with Elvis in 1976. She clearly knew, though, that Elvis fans would comprise the main market for her memoirs. Other topics along the way will be of interest to the women who still love Elvis, while inviting his male fans to do some scanning. Fashion, for instance. Thompson revels in describing the clothes she wore during her Elvis years, including the night she first met him in 1972. “I smoothed down my short silk skirt, which was fitted at the waist and flouncy. I was wearing it with a matching cream-colored bodysuit printed with lavender flowers, and lavender suede high-heeled sandals.” Then there’s the time Elvis sent her out to buy a whole new wardrobe in Las Vegas: “I bought these stunning, sleek jersey dresses that fit me like a second skin, and would peer at myself in the mirror with wonderment at my good fortune.” You get the picture. 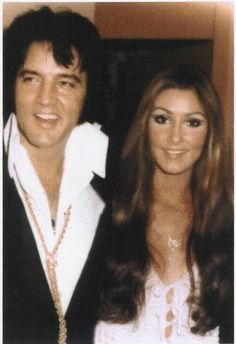 Thompson’s story opens with a phone call on August 16, 1977, from a distraught Lisa Marie telling her that Elvis is dead. Having parted with Elvis just the previous December, Thompson did her best to comfort Lisa Marie. Once the shock past, Linda asked herself a pivotal question: “What would he want me to wear to the funeral?” It seems a shallow thought at first, but as subsequent chapters reveal how Elvis had micro-managed her appearance in their years together, it seems like a natural question. Thompson then briefly recounts her growing up in Memphis. An Elvis fan, she saw all his movies at the Strand Theater and memorized all the lyrics to his songs. Like many other Memphis teenagers, she made the pilgrimage to Graceland’s gates to get the King’s autograph. Her narrative then jumps forward to describe in detail the evening of July 6, 1972, when, at the age of 22, she met Elvis Presley at the Memphian Theater. They were drawn to each other immediately, and spent hours that night making out in the theater. He invited her to Graceland to meet his father the next day before she left town on a family vacation the next day. When she later returned to Memphis, she learned Elvis had been frantically trying to find her. This directly quoted rant by Elvis is an example of an unusual feature of Linda Thompson’s story. Throughout she provides similar quotes from Elvis and many others, including herself. One of the tenets of journalism is that quotation marks should only be used to relate the exact words spoken or written by the person being quoted. Now, there is no way Linda Thompson could remember the exact words Elvis spoke on the above occasion or on the many others occasions that she quotes him directly. Therefore, the reader has to trust that she constructed these quotes based on vivid memories of what Elvis actually said. Keeping that reservation in mind, though, Thompson’s strategy of using direct quotes is very effective in bringing Elvis to life in her narrative. 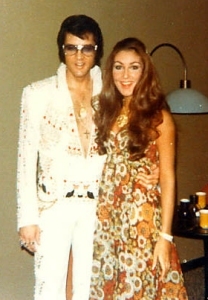 Paraphrasing, which is what authors usually do in such cases, would not capture the emotional communications that Elvis Presley and Linda Thompson obviously shared during their relationship. Still, it must be noted that when Thompson quotes Elvis, it is not exactly what he said. Thompson describes how she and Elvis immediately became soul mates. “Those first few days with Elvis were sublime,” she recalls. “He was incredibly romantic, tender, thoughtful and loving.” She was more than willing to merge her life fully with his. “From the start, my life revolved around him and his schedule, and making him happy, which along with his laughter, became the greatest source of my own happiness.” Incredibly, Thompson reveals that during their first year, they were together 24 hours a day, 7 days a week, except for Elvis’s occasional excursions to Thunderbird Jewelers in Las Vegas to buy presents for her. Theirs was a deeply woven, multi-layered relationship, according to Thompson. She spends a good portion of her text explaining the intricacies of the bond between them. The following passage summarizes it best. • Linda Thompson was a perfect fit for Elvis? Of course, Elvis’s female fans will want to know why Elvis chose Linda Thompson from among the multitude of women who aspired to become his girlfriend. She believes the answer lies in their common backgrounds. Both were raised in poor Southern families with mothers who expressed their love through baby talk. Linda first met four-year-old Lisa Marie at Elvis’s Los Angeles home in 1972. They brushed each other’s hair, and “were close from that moment on,” Thompson says. Elvis and Priscilla were working through their divorce when Linda came on the scene. She describes only limited and cool but cordial contact with Lisa Marie’s mother. Colonel Parker entered Linda’s world only when she accompanied Elvis on tour. She believes Elvis’s manager held him back in those years, both from performing overseas and returning to acting, which she says Elvis wanted to do. 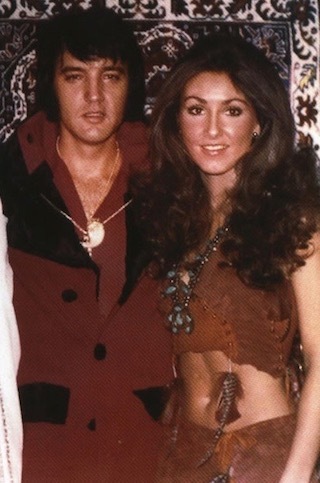 Of Elvis’s entertainment career during her years with him, Linda Thompson has little to say in her book. She indicates that she was seated in the audience for his Las Vegas shows, but she does not offer an opinion about them. She does praise his 1973 “Aloha From Hawaii” special as “an amazing show for fans the world over.” If she ever attended a Presley recording session during those years, she doesn’t mention it. While not commenting directly on Elvis’s stage work in Las Vegas, Thompson does describe his afternoon preparation in their Hilton suite for those shows. 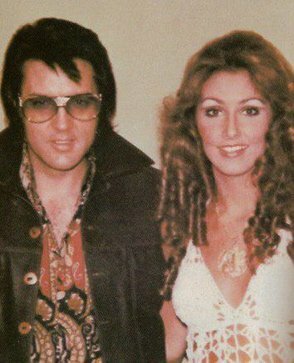 Of course, Linda Thompson experienced Elvis’s dark side, and discusses his prescription drug use, his explosive temper, and his infidelities during their years together. She mentions no physical abuse of her, but his intense jealousy at times erupted against her if he thought she looked at or spoke familiarly about another man. One telling temper tantrum occurred in the months after the “Aloha” special, when Elvis started putting on weight. Thompson says he loved ice cream sandwiches and at times would eat a whole box of them one after the other. At times he sent her downstairs at Graceland to get them one at a time for him. Once on her mission to the kitchen, Charlie Hodge told her not to give Elvis another ice cream bar because he was putting on weight. Linda says Elvis overheard Charlie, and exploded at his old friend. That kind of angry reaction by Elvis should be a revelation to those of his fans who wonder why the guys around him didn’t do something to stop his self-destructive behavior. Early in 1974, the gathering storm that would end Thompson’s relationship with Elvis, and eventually his life, began to grow in strength. She describes the hospital stays, the drugs, the guns, the obesity, and the other women. She left him briefly in mid-1974, but went back quickly. She finally moved out of Graceland for good in December 1976. I suspect most Elvis fans will find this section of Linda Thompson’s story unpleasant, but for those who want to know it all, it’s there. Linda Thompson’s book contains many interesting sidebar anecdotes. She reveals her personal recipe for making Elvis’s favorite peanut butter and banana sandwiches. There are interesting little stories, such as the time a bullet Elvis fired came through the wall, barely missing her in a Las Vegas bathroom, and the time Elvis almost drowned in his chicken noodle soup. There’s not a whole lot of humor in Thompson’s book, but I laughed out loud when she explained why Elvis wore high-necked collars and what Elvis did when he had to take a piss while watching Don Rickles’ show in Las Vegas.